China and earthenware manufacturer at Cauldon Place Works, Shelton (Hanley), Stoke-on-Trent. Subsequently: In 1962 the firm was divided when the porcelain side was continued by E.W. Brain & Co. Ltd., (now Coalport, which in turn is part of the Wedgwood group). The business of Cauldon Potteries Ltd. was acquired by Pountney & Co. Ltd. of Bristol during the later part of 1962. The business of Pountney Ltd failed in 1977.
around 1891, and was used by each subsequent owner. the name "Royal Cauldon" from. Why is some of the Cauldon ware marked "Est 1774"? First fact: Cauldon Potteries Ltd were established in 1920 and Cauldon Ltd were in operation from 1905-1920. 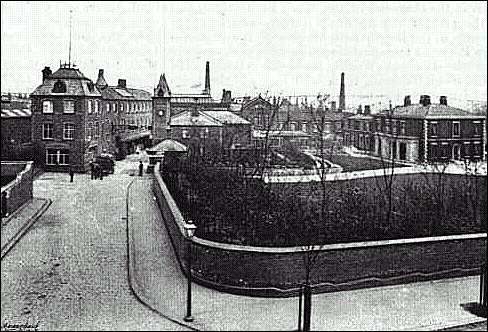 Second fact: The factory "Cauldon Works" was built in 1802 by Job Ridgway. Therefore by no stretch of the imagination was the firm "Cauldon Ltd" or "Cauldon Potteries Ltd"; or indeed the buildings it occupied established in 1774!! However potters were very fond of working back to find the earliest date they possibly could to incorporate in their back stamp. Job Ridgway built the works in 1802 and his father (Ralph Ridgway) was a potter and it is likely that the date "1774" has some connection with Ralph Ridgway. Why is some ware marked Royal Cauldon "Est 1652"? In 1962 Pountney & Co. Ltd. of Bristol took the business of Cauldon Potteries Ltd and incorporated the business into their existing factories at Bristol (and in 1969 in Cornwell). Pountney continued with the crown device and the name "Royal Cauldon" and used it on their ware. In the same way that Cauldon Potteries Ltd used "est 1774" - even though it was not true; Pountney claimed to be able to trace their Bristol factory origins back to 1652. (although at various times they claimed an established date as 1750 and also 1683). They did not start to use the "Est 1652" claim until c.1945. The fact of the matter is that some pottery fragments were found which bore the date 1652 and 1653 - these fragments were evidence of a previous works which had been built over and was later occupied by Pountney. So there were no family or business connections with this previous works - just a location. 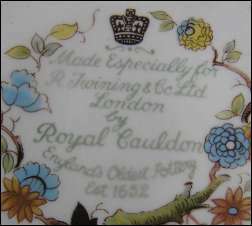 So the claim "Englands Oldest Pottery Est 1652" was fanciful in the extreme; and Royal Cauldon had no physical connection with Bristol - the Cauldon Works were established in 1802 some 150 miles away in Stoke-on-Trent. see a 1956 article on Pountney & Co. Ltd.